I’ve left you guys hanging again for a little while, while my life has been crazy at best! We’ve moved, and school has started for both my son and myself so your girl needed a few days to get readjusted and create a new schedule! I’m back with a gorgeous collection, this is Crystal Knockout’s new set based on a beachy fun party theme! I’m a fan of glitters and microglitters in my polishes and I was literally talking about this type of finish the other day! I adore them in pedi’s as they look so lovely with some cute strappy sandals and blindingly sparkly in the sun! They’re also quite distracting when you’re supposed to be attending a meeting and paying attention… but I wouldn’t know anything about that 😉 Let’s get started! Maximum Sustained Shots. Official description: a lavender holo base with pink, violet, and silver holo shimmer, and purple and silver holo microglitter giving it a sandy textured feel. Swatches show two coats with a healthy topcoat of a quick dry glossy. This one is so in your face sparkly and the lavender base is light looking to me, almost silvery. You can see the purple undertones though, don’t get me wrong. This is a full coverage microglitter, it applies opaque and evenly and the formula has a dense feel that stays where you put it. I think for any of the really heavy microglitters in this set, if you like that smoothed acrylic look I’d suggest a thick topcoat, or two thin coats of a quick dry. For texture lovers any topcoat will be fine. Torrential Rum. Official description: a peach/orange holo base with copper and pink holo glitter, and gold and orange holo microglitter, giving a sandy textured feel. Swatches show two coats with a decent topcoat of a quick dry glossy topcoat. The base in this one reminds me of a coppery bronze. This is another that has a blinding sparkle and gives you that salon smoothed look if you do two thin or one thick coat of topcoat. Once again, if texture is your thing then any topcoat will do. There’s lots of little highlights all over from the different colored glitters and they each twinkle in their respective shade. I think this will be perfect for those fall and Turkey day mani’s! Sangria Surge. Official description: a strawberry pink holo base with purple and red shimmer, and pink, red and silver holo microglitter. Gives a sandy textured feel. Swatches show two coats with a healthy layer of glossy quick dry. In lieu of repeating myself the topcoat/texture is similar to the two polishes above. The base is a lush light strawberry pink and the various colors of glitter sparkle like crazy. In all of these, you can see the shimmer, though the glitters are just so sparkly it takes a backseat. 100 Margaritas Per Hour. Official description: a bright lime green base with rainbow iridescent glitter, scattered holo shimmer, and green micro glitter giving a sandy textured feel. Swatches show three thin coats with glossy topcoat. This one felt creamy to me, it was still super coverage but it almost has a crelly feel during application. I think most will get away with two coats. Honestly, I probably should have stopped at two, and you’ll see what I mean in my swatch video. The base is a lush lime green with white undertones (as opposed to chartreuse undertones). I think this will flatter medium and deep tones really well. Surf’s (and bottoms) Up. Official description: a baby blue holo base with aqua and rainbow iridescent glitter, and light blue holo micro glitter giving a sandy feel. Swatches show two coats with a thick layer of glossy topcoat. Similar in texture, and a lovely opaque feel during application as the other microglitters. The base is a lightened baby blue, with the aqua and light blue glitters giving a strong sparkle. In person you can see the various sizes and up close how they all form this cohesive holo shine. Liquor Advisory. Official description: a bright pink base with rainbow iridescent glitter, purple blue iridescent glitter, and pink holo microglitter giving it a sandy textured feel. Swatches show two coats with quick dry glossy topcoat. This is a personal top pick in the collection, though I truly love them all; I honestly miss these types of finishes. Formula is similar to the lime green in that it has a more creamier feel to it during application. This is a perfect Barbie pink to me that I think is so flattering. You can see various glitter sizes in this one and overall you get a twinkling pink masterpiece on your nails. Swirling Wines. 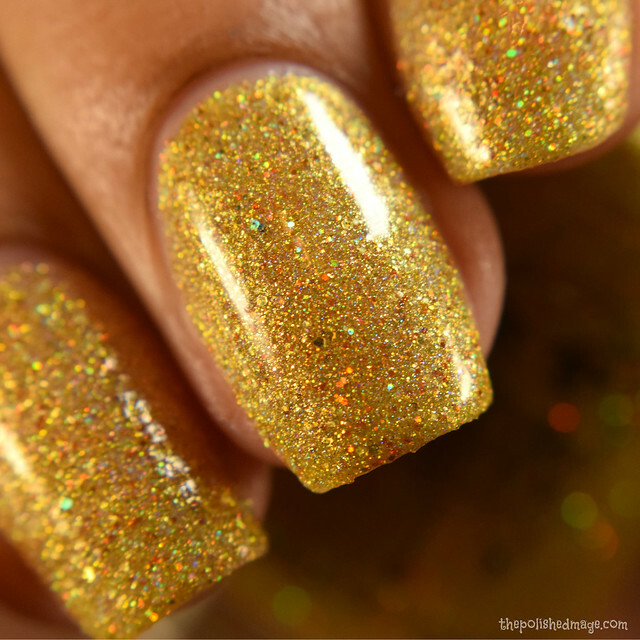 Official description: a gold yellow holo base with lemon yellow iridescent glitter, and orange and gold holo microglitter giving it a sandy textured feel. Swatches show two coats with a thick layer of quick dry glossy topcoat. I can totally see this shade working for any season. In person it’s a golden toned yellow that has a lovely contrasting glitter appearance with the orange and gold microglitters. Similar to the super microglitters in texture and feel in this collection, I’d suggest two thin coats of topcoat or one generous layer for that smooth appearance. Once again if you love texture then any topcoat will do. There you have it! All of these are so awesome in their density and ability to built to complete opacity at two coats. Working with several of Candice’s shades over the course of a few months, I have begun to expect that despite being loaded with pigments and goodies, her polishes are so easy to get full coverage. I highly suggest checking out my swatch video to see them in action (come for the shinies!!). The Hurricane Party Collection releases September 1st over at Crystal Knockout’s site. Each polish will be $10, and be sure to take advantage of free shipping for orders over $35 within the US!